Things will wrong. That's part of life. Whether or not tricky situations have a huge negative impact, or are simply a minor inconvenience, very much depends on your attitude, and how proactive you are. Living life reacting to problems in the heat of the moment makes the difficulties bigger than they really are, and causes undue stress. 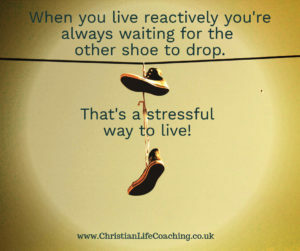 When you are proactive and choose to respond rather than react, it will take the heat out of situations challenges and make for a more stable life. It's much easier to be calm, cool, and collected when you're proactive. Be proactive and defuse potential challenges before they become problems. Imagine you have a car with 250,000 miles on the clock. There's a good chance it will break down in the next couple of years. If you're proactive, you'll either plan to buy a newer car before that happens, or you'll start saving money for possible repairs.If you just let things ride and don't make provision to help you overcome future obstacles, the chances are that you'll break down when it's really inconvenient and will be begging for a ride or taking the bus in the near future. Give yourself the opportunity to prepare, and work on better solutions. When you leave things until the last minute, you don't leave yourself with much room for maneuver, most of the possible solutions evaporate. Because you didn't leave any margin you don't have the time or resources to consider all the possible solutions. And you're forced to patch together whatever will work in the heat of the moment. Take time to think things through and plan and prepare. Proactive people look ahead, they consider options and know what they'll do if they meet obstacles. This is a more peaceful way of living, and it's more effective than living life by the seat of your pants. Create an environment that supports you living life well. Reacting to the events that life throws at you is a recipe for merely surviving. You'll spend most of your time putting out fires rather than creating a better more fulfilling life. Planning ahead and being proactive allows you the space and the luxury to create something beyond what you already have. When you're proactive you'll feel empowered. When you're proactive, you take responsibility for your life and for your decisions. That comes from believing that you have the ability to choose, and what you choose matters. When you wait until there's an issue before you take action, you're simply reacting to life rather than designing it, and being tossed to and fro by events. Give yourself the luxury of having more choices. If things are a little rocky at work, your boss clearly doesn't like you, and his power seems to be growing by the day... If you start looking for a new job today rather than waiting until things become unbearable, you'll be heartened by knowing that there is a way out, and you'll be opening the door to potential choices. If you wait until you can't face going to work, or until you're fired, you might have to take whatever you can find. And that could be a case of jumping from the frying pan into the fire! Create circumstances that lead to peace of mind. When you're proactive you'll be able to live life with less anxiety. You will already be aware of what could happen and you'll prepared for it. So there'll be nothing to worry about! Being proactive helps clear the way ahead. Choosing to look ahead and consider your options allows you to develop a workable plan for your future. Proactive people know where they're going and how to get there. They have a plan. There are many benefits to choosing to be proactive each day. 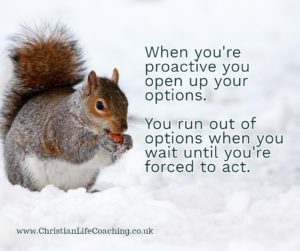 Proactive people have control over their lives. Challenges can be nullified before they become full-blown issues. It's a more enjoyable, peaceful, and effective way to live. Spend a few minutes each evening looking ahead for a day, a week, a month, a year, and five years. How will you ensure that you stay on track? How can you maximize your opportunities and minimize potential challenges? Take time to plan each day with God and see where it gets you!